Pompeii has the best press, but the eruption of Mount Vesuvius in 79 AD also buried the town of Herculaneum. Charred scrolls were recovered from the town library in 1752, and Italian scientists just discovered it might be possible to use X-ray technology to read them. Their findings were published recently in the Proceedings of the National Academy of Sciences. 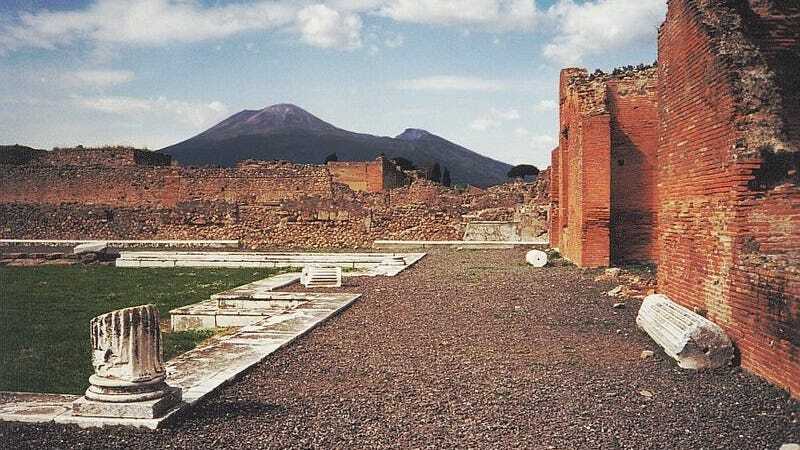 The eruption of Vesuvius, and the subsequent annihilation of nearby towns, was a tragedy that turned, over centuries, into an archaeological opportunity. Furniture, animals, home utensils, and frescoes—these have all informed modern people about the lives of ancient people. One exception is the scrolls of Herculaneum, which were charred through, due to the heat of the falling ash. They were discovered centuries ago, but are too delicate to be unrolled. Generations of historians and archaeologists pined over them. Now scientists from the Italian National Research Council believe they’ve found an aspect of the scrolls that may make them readable. Everyone thought that the people of Herculaneum, and other ancient societies, wrote with carbon-based ink. Though eventually metallic inks made their way into the mix, it was assumed that this happened well after 79 AD. But when the scientists took fragments of the scrolls to Grenoble, France and put them in a particle accelerator, the technique revealed quite a lot of lead in the ink. Lead is something that X-rays, if sensitive enough and calibrated the right way, can pick up on. The scientists have plans to X-ray the scrolls in Naples this year. If the procedure works, we could be the first generation of people to read those scrolls since they were essentially annihilated nearly 2,000 years ago.